Paleo bars filled with pumpkin and spice! These little squares of heaven taste just like pumpkin pie! And they’re paleo:) Which means they’re gluten-free, refined sugar free and dairy free. 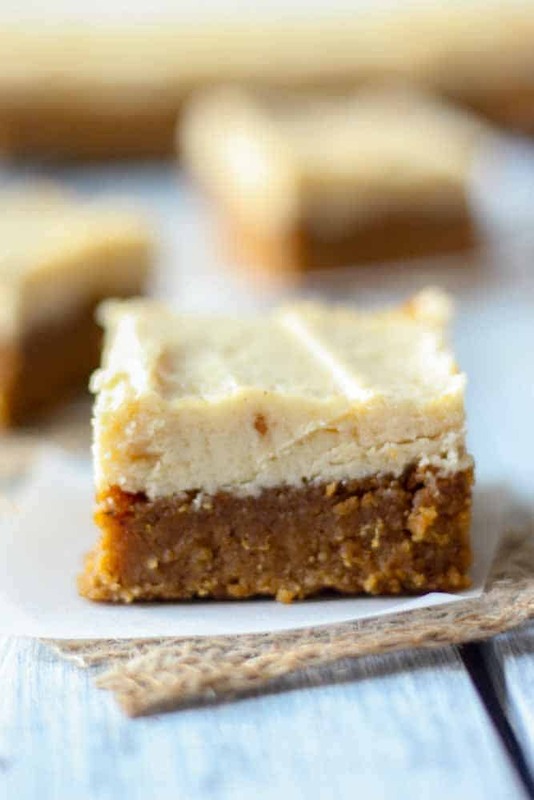 They taste like fall in a bite and are topped with a light maple frosting you will be drooling over. Welp, it’s here. Fall baking is here. I had my first PSL yesterday and it was everything I remember it being. Though I did get it iced because it was just under 1,000,000 degrees yesterday. And it was so spectacular and flavorful. I just had the most lovely Labor Day weekend. I got to watch one of my very good friends get married and then celebrated my grandma’s birthday with my entire mom’s side of the family. I paused for a moment while we were grilling out yesterday afternoon and looked around at everyone to appreciate how happy and healthy everyone was. The littles moments sometimes take up the biggest parts of our heart❤️. I’m usually the one to bring the desserts to the gatherings but because I was coming from the wedding celebrations out of town I didn’t have time to create anything for the soiree. 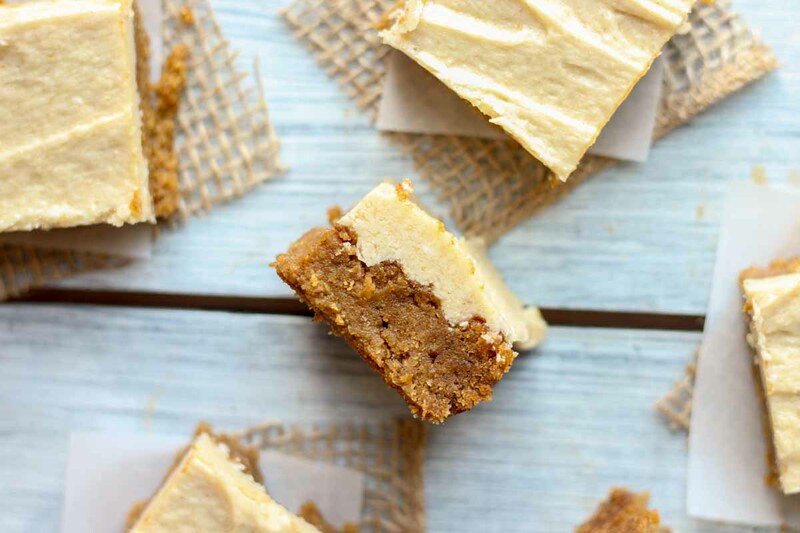 I would have loved to bring these Paleo Pumpkin Bars! My mom went gluten-free about two years ago after a doctor told her that there’s a chance it would help the symptoms of her arthritis. And it worked! The gluten-free diet helps regulate the swelling in her joints so she eats gluten free as much as she possibly can. 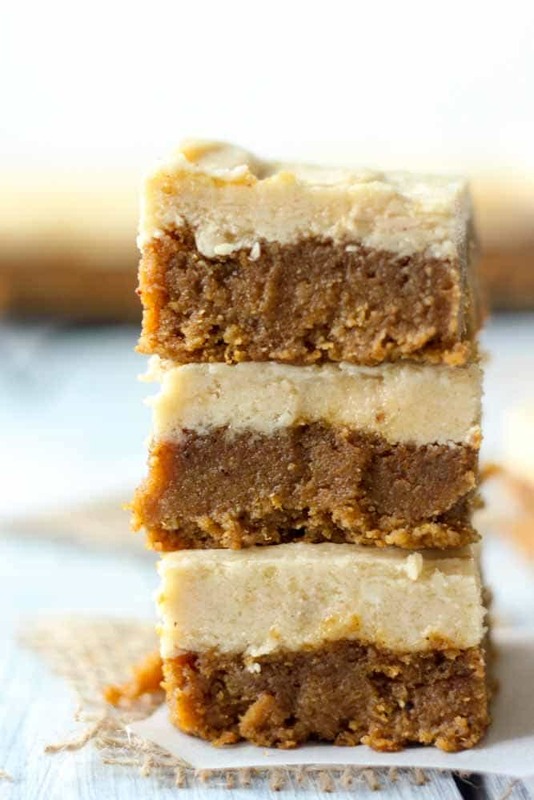 Because these bars are made with almond flour and coconut flour they’re perfect for her! I’m also just trying to clean up my diet, even with swimsuit season behind us! I’m doing my best to keep the sugar, fat and guilty sweets out of my daily diet. Especially since I just started a new work out program! And it just so happened to have been created by my amazingly talented boyfriend. He has his Masters in Exercise Science and just launched an online personal training business called, Hearbeat Strength. Beyond all the smarts he’s got going on he’s easily the most inspirational person I know (his story is awesome!). If you want to be motivated and encouraged by someone’s story, I highly encourage you check it out! And lucky for me (and maybe you!) these bars are approved by him! They’re naturally sweetened with maple syrup and the bars taste so much like pumpkin pie. It’s kind of not fair how yummy they are. They taste like they should be filled with sugar and salt and butter and everything in between. But they aren’t! It’s so magical. When the cold weather hits all I want is pumpkin everything and savory recipes to celebrate the season. But the additional pounds to keep me warm? Not so much. Anyone feel me on this one? One of my favorite things about this recipe is that it’s pretty straight forward. No special tricks or difficult steps, you just mix it all up and put it in the oven. One thing to note is that this is made with almond flour. I love to use coconut flour in my paleo baking as well, but because coconut flour absorbs more moisture it’s best to stick to almond flour on this one. You just bake, chill and frost! Wait until the bars are completely cooled before you begin frosting. Then chill again to allow them to set! I cut mine in to pieces after throwing them in the freezer for 15 minutes. It made the layers clean and perfect. Annnnd go. Get your pumpkin on! To make the bars, preheat the oven to 350 degrees F. Grease and line an 8x8 baking dish and set aside. Combine the almond flour, salt, baking soda, baking powder and pumpkin pie spice in a small bowl and mix well. Set aside. In a medium to large microwave safe bowl, add the coconut oil and almond butter together. Place in the microwave and heat on high for 30 seconds. Stir well and place back in the microwave to heat completely. Remove from microwave and stir until combined. Add the coconut sugar, maple syrup, vanilla and almond milk to the almond butter and coconut oil and stir until well-combined. Add the pumpkin puree and stir well. Pour mixture into the prepared pan and place in the oven for 30-35 minutes, until center is set. Bars will be slightly moist. Allow to cool in pan for 15 minutes then place the bars in the pan in the refrigerator for at least 30 minutes, or up to a few days. While the bars are cooling, prepare the frosting. In a medium bowl, beat the grass-fed butter or ghee until smooth and creamy, about 1 minute. Add the maple syrup, cinnamon, coconut flour, coconut milk and coconut sugar and beat will until combined, about 2 minutes. If you're using ghee add an additional tablespoon of coconut flour. 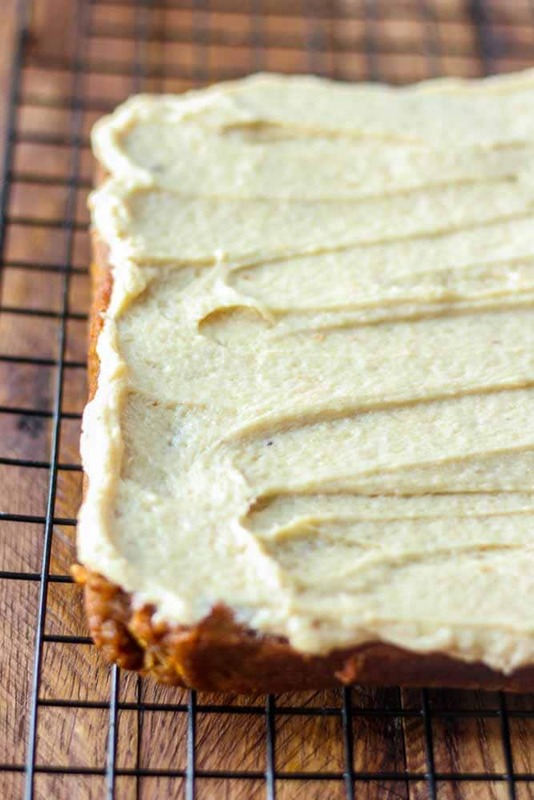 When bars are completely cool, remove them from the pan and cover them with the frosting. Chill in the refrigerator again for 15 minutes. Cut and enjoy! Or keep in the refrigerator for up to one week or in he freezer for one month. Some of the links above are affiliate links, which pay me a small commission for my referral at no extra cost to you! Thank you for supporting What Molly Made. WOW do these bars look amazing or what! As a lover of all things pumpkin, I can’t wait to be able to bake recipes with it. These bars look super moist and decadent, no one probably knows that they are healthy! These pumpkin bars worked out great! Not sure if most could appreciate them, but one person asked for the recipe. Thank you. These look incredible!!!! Do you think I can sub coconut oil for the butter/ghee? I can’t tolerate dairy at all. Fingers crossed!! Hey Lydia! So glad you think so. Yes, you can sub coconut oil for the butter/ghee:) Any fat that is solid at room temperature would work here! So coconut oil is perfect. Just don’t melt it! Please let me know how it turns out. Hooray! Thanks so much, I will definitely let you know! Has anyone doubled this recipe? If so, what size pan should I use? I’m cooking for a crowd for Halloween and want to make 1 pan. Thanks for the recipe — it looks wonderful! Hi Cindy! Thanks for reaching out and for your sweet note:) I haven’t tried doubling this recipe, but you should be able to use a 9×13 pan without a problem. I would just pay extra attention while they’re in the oven because the pan size can affect the baking time. Start watching it at 35 minutes and check the center with a toothpick to see if it’s set. The bars should be moist (like pumpkin pie) but not too undercooked where they won’t set. Let me know how it turns out! Hi Stacy! Sorry, I haven’t doubled it yet or heard back from Cindy. But I think it’s a safe bet to double it using a larger pan. Just start checking around 30 minutes for doneness. I’m making this for Thanksgiving as well:) Hope it’s a great one with you and your family! Doubling the recipe worked great! They were done around 35 min. The butter frosting however did not. I have no idea what happened there, but it was way too buttery tasting and the maple didn’t combine in well. I ended up just making whipped cream for on top and that was great!! I would like to try a double batch, too. I was so excited to read this, but then I saw it has ghee in the frosting. With a casein allergy, that is not dairy free. So sad. Any alternatives? Hey Mari! You can definitely sub the ghee/grass fed butter for coconut oil. Any fat that’s solid at room temperature will work. Do you have the nutritional value on these? Thanks! Could you please post the nutritional facts on the bars? Thanks! Hey Natasha! I just added a nutrition label to the post. It’s under the ingredients and directions. Let me know if you have any questions! Is that suppose to be a 1/4 TSP instead of tablespoon of cinnamon in the frosting? Yep! Proofreading fail at its finest:) I updated the recipe. Thanks! Yours look so amazing! I tried but mine came out very dry, they still taste good. I’ll have to try it again! Sorry to hear that, Amy! Please let me know if you have any questions or give it another try. Should the finished baked part be cooled on a rack, so take it out of the lined pan? When? The picture shows a baking rack with the cooked part befire it’s frosted, but instructions do not mention it. Please advise. THANK YOU! Are those nutritional facts for all 12 servings or 1 bar? Hi Rachel! Those are for one large bar. Getting ready to make these – What size can of pumpkin? Hi Annette! I’m so sorry I missed your comment. You can use a 15 ounce can. I used the 15 ounce can of Libby’s Pure Pumpkin. You won’t use the entire can, just a cup! I like to use the leftover pumpkin in smoothies and oatmeal. Thanks! I made these for a bunch of paleo skeptics. These were phenomenal! I’ve been asked to make them again for Christmas. I followed your recipe to a tee and it turned out as the best paleo baking recipe I’ve ever made. Hi Julia! You have no idea how happy that makes me! I’m SO glad you and everyone liked it—even the paleo skeptics! I recently made these for a large group and no one even knew they were paleo. The kids were going crazy over them! Thank You! I’m definitely going to try this! As someone on SCD, I can’t have baking powder. Can it just be left out, or do I need to substitute with something else? Hi Patty! Are you able to use baking powder? If so, I would substitute the baking soda for 1 teaspoon of baking powder. Let me know if that works!